Since the short-term top in the S&P 1500 on May 19th, the average stock in the index is down 8.4%. We broke the index into deciles (150 stocks in each decile) based on each stock's short interest as a percentage of float (at the market top) to see if the bears have been licking their chops. Below we highlight the average performance of stocks in each decile from 5/19 to today. 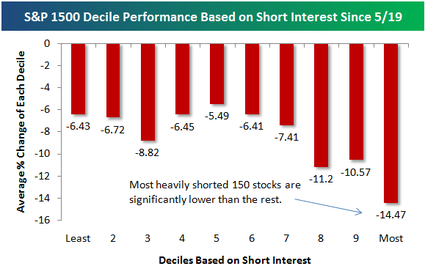 As shown, the decile of stocks that are the most heavily shorted is down an average of 14.47% since 5/19, while the least heavily shorted decile is down an average of 6.43%. Clearly, the shorts have been piling on and winning as the market struggles.